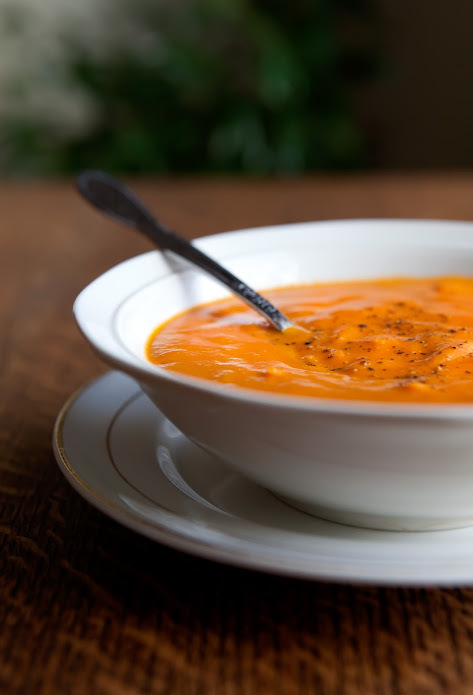 One of my favorite things about the cooler weather is the reappearance of soups in the menu again. Soups are so versatile and usually quite simple. They're warm and comforting on chilly days. And they're also perfect for dipping fresh crispy bread - which is always a good thing. This soup is so flavorful. It is extra tomato-y and wonderfully creamy. A huge thanks to our wonderful neighbor and friend, Michelle, for sharing this fantastic soup recipe! Notes: You could leave the orzo out of this soup, if you don't have any on hand, but I would strongly advise against doing such a thing. (Pasta makes just about everything better, IMHO.) Also, be sure to taste the soup as you're finishing it up to know if it needs any additional sugar or salt. Enjoy! Bring a large pot of water to a boil. Generously salt it, then add the orzo. Cook just until al dente. Drain the pasta, reserving 2 cups of the cooking water. Set pasta and water aside in separate bowls. In a large soup pot, heat butter over medium heat until melted and hot. Add the celery, carrots, onion, and a generous heap of salt. Cook the vegetables, stirring often, until just tender. Add the garlic and cook for 30 more seconds. Stir in the chopped tomatoes, orzo cooking water, 2 cups water (or broth), tomato paste, basil, oregano, and black pepper. Bring to a boil, then reduce heat to a simmer. Let the soup simmer uncovered for 30 minutes, or until slightly thickened. Working in batches, transfer the soup to a high-powered blender. Puree until very smooth, then return to pan. (You can also puree the soup right in the pot with an immersion blender, if preferred. I find that this doesn't get the soup quite as smooth as a stand blender does.) Add 3 teaspoons sugar, the cream, and the cooked orzo. Taste and add additional water (or broth), sugar, and salt as needed. Heat through, then serve with a little freshly ground black pepper to garnish.